On June 11, Richard Urena was hitting .243. Thanks to a torrid month, the Blue Jays' No. 6 prospect is on the cusp of the .300 mark. Urena went 5-for-5 with a double and a run scored on Saturday before Class A Dunedin fell at Fort Myers, 6-4. With the first five-hit game of his career, the 20-year-old shortstop is hitting .292. According to his manager, Ken Huckaby, Urena's hot streak has as much to do with what he's doing off the field as what he's doing at the plate. "He's a lot more mature and focused on his ultimate goal," the skipper said. "His work every day shows that he's working for a lot more than just this level. He's a real athletic kid and he wants to play every day. He just shows up every day ready to play." Huckaby said he's more than confident in Urena to deliver out of the two-hole on a consistent basis, relying on his ability to adjust to some of the Minors' best young pitchers. "He handles hitting in the two-hole so well for his age," the manager said. "I don't think he knows any other place than there. He makes good contact, can steal some bases and has good power in his bat. He's not someone the other team can take lightly. "He's not being pitched the same way twice. Pitchers up here can control more pitches and he's making good adjustments so he can get his hits and his doubles." The native of the Dominican Republic knocked singles in the first, third, fifth and seventh innings before capping his night with a double to left field in the ninth. As impressive as Urena's first five-hit night was, his manager liked the fact that the switch-hitter stroked three of his hits from the right side of the plate even more. "Three of his hits tonight were right-handed, which made his game that much more impressive," Huckaby said. "He's done well all year from both sides of the plate in just his third full season of switch-hitting." 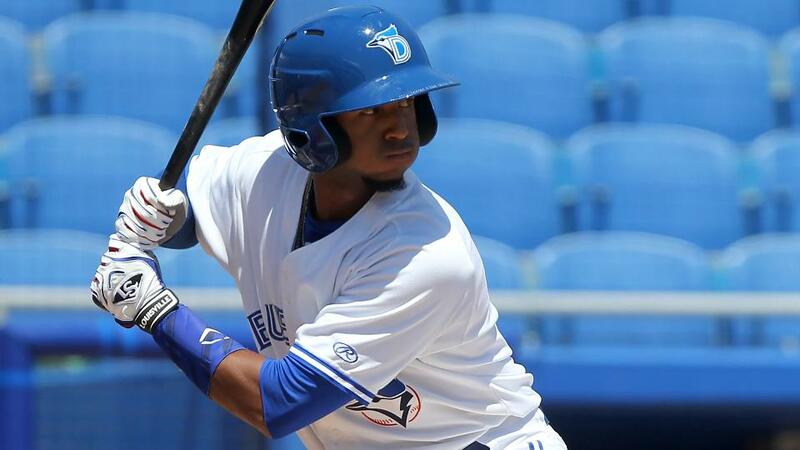 Urena, who was promoted to Dunedin last year, has four homers and 25 RBIs in 75 games for the D-Jays. He's batting .454 (20-for-44) since June 30 and four of his last five games have been multi-hit efforts. "Over the past week or two he's been putting at-bats together better and better, and tonight was kind of just a peak of what he's been doing the past couple of weeks," Huckaby said. "He's raised his average like 20 or 30 points in the past couple of weeks, which is really tough to do when you're carrying the at-bats he's carrying for us." Blue Jays No. 27 prospect Ryan McBroom went 2-for-5 with an RBI and a run scored. Eight different players accounted for Fort Myers' eight hits, with A.J. Murray and Daniel Kihle homering for the Miracle. Fort Myers starter Sam Clay (1-0) allowed two runs on nine hits and three walks while striking out two over five innings in his Florida State League debut. Brad Allen (4-5) surrendered four runs -- two earned -- on five hits and two walks while fanning five in three frames for Dunedin.